Happy Halloween! I love Halloween. It’s one of the most enthusiastic holidays, and I love enthusiasm. I love costumes, and kids in costumes, and clever adults, and I also of course love pumpkins — and the color orange. Oh! And candy. Of the commercial candies, the ones I consider top tier are: Snickers, Reese’s Peanut Butter Cups, and I think?? Peppermint Patties. What’s your favorite candy? I wish I had one of those blogs with lots of photos and hotlinks and videos embedded. Well, not really, but you might wish that’s what I had. As evidenced by the text-heaviness of my blog, I am far more word-oriented than visually artistic. Which is why I am TELLING you what I want to do with my Halloween costume rather than showing you. Have you seen the Yes We Carve site? It’s a showcase of people creating pumpkins with the Obama logos. 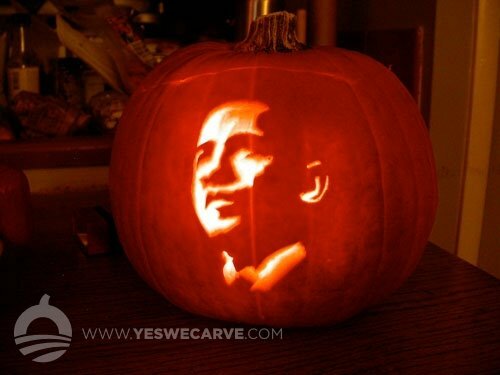 They provide stencils so if you are basically a genius, you can make a pumpkin that glows with Obama’s actual face. Because it’s such an exciting time in terms of the election and also, since my tummy is concurrently getting so round as we near week 26 of pregnancy, I wanted to dress my stomach like a Barack O’Lantern. In terms of Halloween costumes, I’m generally much better on the conceptualization than the execution. I was sort of sick today and after I went to the vet this morning (thanks for jumping to the conclusion but no, I do not go to the vet when I am sick, but the cat did have an annual), I didn’t have the energy to make a real costume or even get an orange tee shirt or a white one I could write on, but I doubt I would have, anyhow. I did consider whether our landlords, who are a painter and a potter, could help me, but they weren’t around. We’ll see if and how it turns out! Okay, that would definitely go in the original category, a costume for a stomach. I have only ever seen mother’s-to-be go as nuns!Hey, the 6th Ave Parade was great. Best Halloween costume ideas this year were:1) The Bike Path this was a couples costume, both were in ninja black with strategically placed reflective material. If they stood just the right way, she became the Ped Lane and he became the Bike Lane.2) Several Obamas. Best two were Obama with Bo Duke and Luke Duke of Hazzard Co and then Obama guy who, basically, just had the right complexion and haircut and then put on a power tie and waved Presidentially.3) Guy taking a shower (with curtain and plumbing)4) Easily recognizable but still great: Where’s Waldo, red Cookie Monster with jiggly lower jaw + girlfriend as ostrich. Actually, the ostrich was my favorite of the whole parade — it honored the ancient asthetics somehow, trying not at all to look like an ostrich but rather to be the idea of an ostrich. It was homemade, not perfect, and somewhat laborious though not slavish. Ostrich paper mache head, feathery wings on her arms, leotard lower half, and a rehearsed ostrich like movement as she moved down the street. face totally visible — I think that was a critical aspect. 5) kudos to any photographer who bothers to make a costume. There were lots of guys with press passes and one was dressed as the pontiff (“call me the Pope-a-razzi”).We were pirates pulling a kayak on moving dollies. Our main activity was to keep girls from jumping into the boat. This was mostly going on because our “captain” was soliciting them with a hard slap on the rump as we passed, which usually brought them into our orbit, rather than the opposite for some reason.I think for next year I will try to figure out where to watch the Greenwich Village Halloween Parade. I think one of the best places to see the halloween parade in New York City is Jefferson Street Market library block. It was not too crowded there. But someone told me that might be because that block was off limits (giant spider in belfry). Maybe up around 19th oand 20th street is better than down by the start of the parade at Spring Street. Spectators were packed unpleasantly deep there — 8 deep at least, unable to move. Another cheater’s way would be to spectate the staging area, well below Spring, going almost to Canal Street, below Soho.